Digital remittances will become increasingly important as the world continues to more broadly embrace digital everything. Boston, October 31, 2018 – Cross-border remittances are a critical part of developing economies around the world and provide a lifeline for many as the world continues to globalize. A battle is waging in this industry sector as fintech firms challenge legacy players by employing digital-first business models. These players have firmly established themselves in the market by capitalizing on the way consumer behavior is changing in the digital era. 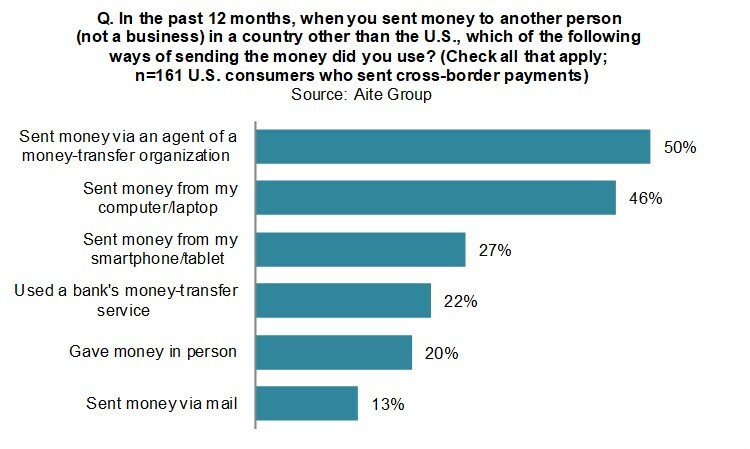 This report examines U.S. consumer usage of digital payment methods for cross-border remittances and profiles some of the companies that have gone to market with a digital-first business model (Remitly, Transfast, WorldRemit, and Xoom). It is based on a quantitative study that Aite Group conducted in Q4 2017 of 1,974 U.S. consumers. Aite Group also conducted interviews with eight executives from leading money-transfer organizations around the globe from May 2018 to June 2018 to support this report. This 20-page Impact Note contains seven figures and six tables. Clients of Aite Group’s Retail Banking & Payments service can download this report, the corresponding charts, and the Executive Impact Deck. This report mentions Accel, Apis Partners, Bezos Expeditions, DFJ, DN Capital, Founders’ Co-Op, GSMA, LeapFrong Investments, MoneyGram, PayPal, PayU, Silicon Valley Bank, Stripes Group, QED Investors, TCV, TomorrowVentures, Trilogy Equity Partners, Western Union, World Bank, and World Bank’s International Finance Corporation (IFC).